Primate origins stretch back to the Cretaceous, perhaps over 80 MYA (million years ago) (Martin, 1993, 2000; Tavare et al., 2002). The date is just a prediction, but one that happens to coincide, very roughly, with the appearance of a significant number of angiosperms in the fossil record. It is not very clear what early flowering plants looked like. However, evidence from exceptionally well-preserved sites suggest that early dicotyledonous angiosperms (dicots for short) were predominantly herbaceous, clumped together with large (monocotyledonous) palms in windless humid patches, perhaps around streams, and interspersed between large areas dominated by ferns, various gymnosperms, and cycads (Wing et al., 1993). Evaporation from the streams might have been responsible for the high humidity. It is increasingly likely that angiosperm evolution was linked to an aquatic or semiaquatic habitat and such a relatively still and damp environment was surely required in order that insect pollination (which typified even the very earliest dicots—Crane et al., 1995) would be favored over the accidental effect of wind. Throughout most of the Mesozoic era, herbivorous dinosaurs were the major consumers of plants. We believe that, faced with such megaherbivore pressure, stress-limited defenses were developed. Being small relative to these herbivores, food plants of dinosaurs needed extensive external mechanical protection because a single bite represented potentially life-threatening loss. In order to deter these herbivores, many of these plants probably had widely spaced sharp thorns and spines and any "woody" tissue that they possessed would be dense and positioned as externally as possible in the plant in order to prevent penetration. There would, in any case, not have been much point in attempting to stop a dinosaur feeding by chemical means because the residence time in the mouth of, largely unbroken, plant parts was too short. This assumes, though, that plant chemical defenses are not a furtive attempt to poison animals without their sensing it, but are intended to provide clear clues via taste receptors that poisoning would result if feeding continued. We suspect that, as in living birds, dinosaurs had few taste buds. Poisonous chemicals with aversive tastes would have been no deterrent to dinosaurs because most dinosaurs did not open cells by chewing. We suggest that the ancestor of primates was a small dichromatic predator that lived in angiosperm patches immune from attack by dinosaurs because of the small size of the plants. They hunted for moving insects at night, viewed against smooth tree trunks. Even if insects were hunted against this background in the day, color vision would have no particular value because there would not be sufficient chromatic contrast. However, we think that they may have also searched foliage for static insects in daylight—an activity that could well have been aided by their blue-yellow color vision. This suggested cathe-meral activity pattern is simply a merger of the foraging behavior of nocturnal and diurnal tree shrews, as reported by Emmons (2000). Later, as angiosperms diversified in the Later Cretaceous, early primates moved onto larger plants. Herbivorous dinosaurs of the Later Cretaceous were smaller, down even to 30 kg (Norman and Weishampel, 1991) and probably consumed such angiosperms (Crane et al., 1995; Norman and Weishampel, 1991). These newly targeted angiosperms defended themselves against these dinosaurs by developing tightly spaced thorns and spines. Very small primates developed tactile pads (backed by nails) to sense and avoid these sharp obstructions, coupling this with leaping behavior to jump between them. This is the most plausible explanation for leaping behavior in early primates (Dagosto, this volume; but see Lemelin and Schmitt, this volume for an alternative view). Our scenario is congruent in other senses with the suggestion that primates moved on fine branches (Cartmill, 1972; Sussman, 1991). Movement of primates on plants that were stress-limited means that the Young's moduli of their branches would be likely to be very high and able, therefore, to support their weight much better than angiosperms that were not under attack from such large predators. This behavior would further assist early primates in avoiding predation by allowing them to escape from potential predators. Angiosperms were probably not very common even towards the end of the Cretaceous. After that point in time, however, they started to diversify rapidly. A switch to a warmer, wetter climate in the Early Tertiary may have triggered this (Eriksson et al., 2000). The loss of megaherbivores, replaced by invertebrates, triggered a switch to "woody" displacement-limited defenses that better resist chewing invertebrates by obstructing crack growth. Since cells were inevitably opened, there would have been a rapid diversification of chemical defenses. As angiosperms began to dominate the land early in the Tertiary, multispecies, multilayered, forest canopies began to appear, becoming most diverse at the end of the Paleocene (Eriksson et al., 2000). Specialized seed dispersal syndromes probably date back to this period. In fact, dispersal by larger vertebrates may produce such clumping that tree species adapt so that seedlings can prosper under the crowns of their parents (Dominy and Duncan, 2005). Howe (1989) has argued that the dispersal activities of vertebrates were essential to the evolution of angiosperm diversity. Dispersal by the latter produced clumped tree species, so much so that seedlings could even prosper under the crowns of their parent trees (Dominy, 2001; Dominy and Duncan, 2005). This Late Paleocene world offered expanded habitats for primate species, which may have expanded their fruit-eating activities, initially stealing fruits from targeted dispersers during the day. Since larger vertebrates tend to eat larger fruits with larger seeds (Howe, 1989), the heavier anthropoid primates that evolved through the Later Eocene and Oligocene were probably feeding on highly clumped resources. This may have put pressure on these primates to aggregate into social groups, simply because their target plant species were themselves patchily distributed. This tendency may have favored opsin polymorphism in anthropoids (and, at some as yet undetermined point, in some larger prosimi-ans) with trichromatic females being favored as group members for identifying fruit patches, as has been suggested by Mollon (1989). We believe that routine trichromacy in catarrhines probably only dates back to the start of the Miocene and considerably later in the ancestral howler monkey. 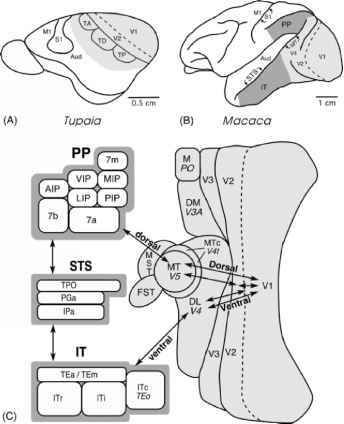 Dominy and Lucas (2001) and Lucas et al. (2003a) have argued that these independent gene duplications are likely to have been associated with the need for primates to rely on leaves as a fallback food when fruits were unavailable.